Experts in Boiler Installations and Gas Safe registered engineers. MJC heating and Gas Safe engineers are qualified to provide you with the best advice on what boiler is right for you. Either having an old boiler replaced or a completely new installation MJC Plumbers are here to help you choose the right boiler for you and your family’s needs. What’s the most energy efficient system suited to my property? What’s the most cost effective boiler suited to my family and me? What types of controls are best for me? We’ve been Worcester Bosh and Vaillant accredited installers for over 10 years. We can offer the best impartial advice and with up to 8 years extended manufacturers warranty. As experts in boiler installations we will come out and visit you at a convenient time and discuss the best requirements for you and your family to have an energy efficient heating system tailor made to your requirements. 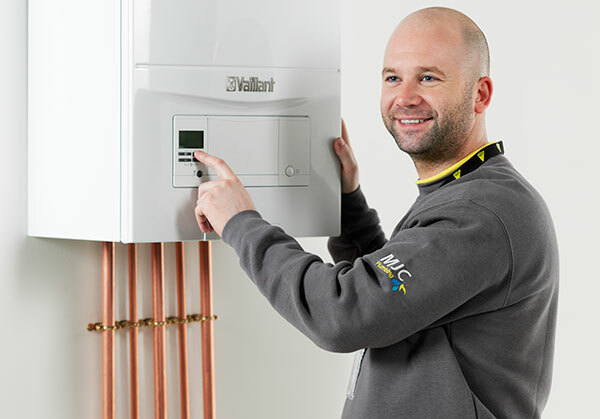 Plus with the added MJC promise of up to 8 years manufacturers Warranty, maintaining your new boiler is off your added expense list, coupled with up to 40% reduced gas bills due to the high-energy efficiency of new boilers. Helping you to reduce your fuel bills and bring your home up to date with a new energy saving heating system MJC Plumbing engineers are fully qualified to install the very latest high-efficiency green star boilers. Not only do these produce minimal emissions of Nitrous Oxide and Carbon Dioxide – meaning they’re both safer and better for the environment, but every boiler we install will carry a SEDBUK Band A efficiency rating – the highest. Which is great for you since they’re more than 90% efficient. We carry out free boiler quotations in the evenings at a time to suit you. Also, all our work is covered by a 2 Year complete peace of mind Guarantee (we are backed by TrustMark a registered approved trading standards company) for every boiler we fit, and our team will send you an annual courtesy reminder to arrange your FREE Boiler Service check.